Imagine an appliance that lets you throw veal, zucchini, and tomatoes on one pan and have them all come out perfectly cooked. 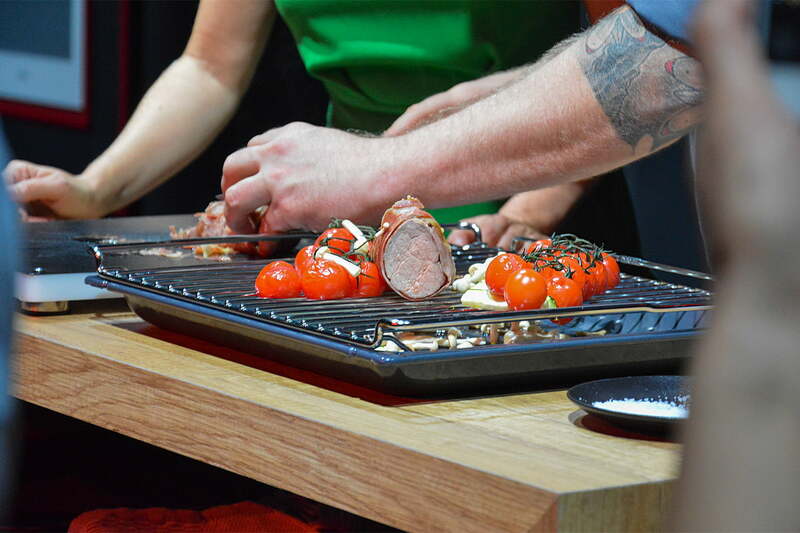 When Miele introduced its $10,000 Dialog Oven with just such a demonstration, it seemed like a magic trick. But the secret is radio frequency cooking technology, and it’s soon going to be available in more forms than an expensive appliance. Just a couple years ago, we’d only seen RF cooking and cookers in concept form. At IFA 2016, we saw Midea’s portable, battery-operated version. Now that Miele has come out with a full-sized version, it’s just a matter of time before these solid-state appliances go mainstream, Dr. Klaus Werner with the RF Energy Alliance told Digital Trends at the recent Smart Kitchen Summit. He predicts we’ll see countertop versions in two to three years for around $1,500. “I think the use of the word ‘microwave’ is something we’d like to stay away from,” said Yuval Ben-Haim, president of Goji Food Solutions, during a panel at the Summit. While both create electromagnetic waves, microwaves use magnetrons and RF uses semiconductors. Theoretically, microwaves with inverter technology from Panasonic can take your 1,000-watt microwave down by 50 percent to give you more flexibility. But most just turn the magnetron on and off, meaning that it’s the same power just for less time. And Werner says the most power you ever need is 550 watts – for making popcorn. Food manufacturers need to make sure their frozen meals will get thoroughly cooked in any microwave, regardless of the power level, so their heating instructions may be overdoing it. The beauty of the microwave is it’s one touch and you’re done, at least, some of the time. But RF appliances will offer no such ease. Manufacturers building the devices and chefs creating recipes for them are going to have to figure things out in calorimetry or joulemetry. Miele created the name “gourmet units” for joules. When cooks want to make that plate of zucchini, tomatoes, and veal, they dial in the gourmet units for each. 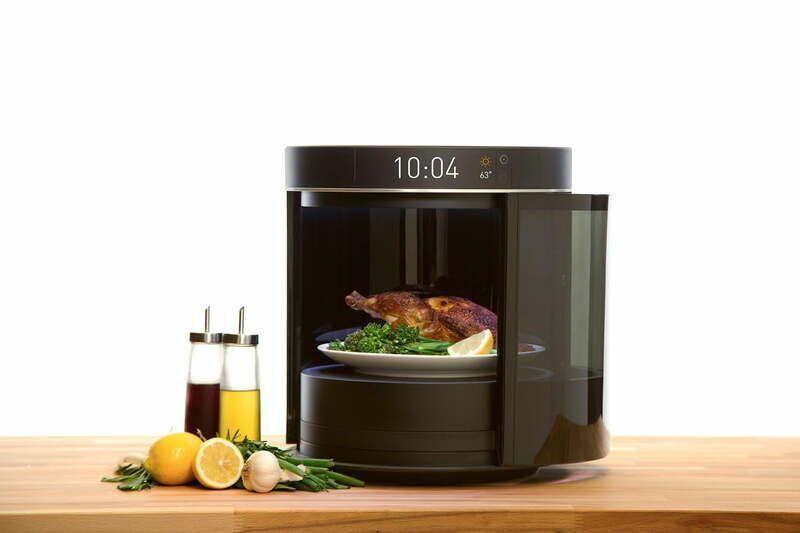 The Dialog Oven takes care of the rest, adjusting the units as it measures the amount of energy used to cook the food. Figuring out those amounts takes a lot of work, though, and it’s a whole new way of thinking of about food for many chefs. NXP makes semiconductors for a variety of solutions, including RF cooking. It’s trying to help make the process more seamless by the time the products arrive in your home, so people won’t have to do mental math every time they try to cook a chicken. But other data, including weight, humidity, and temperature, could serve as additional information when it comes to determining the perfect doneness for a variety of dishes. RF is a technology that’s well understood and has potential uses in industries as far reaching as automotive and medical. (Miele said it first heard of RF because it could be used to thaw frozen transplant organs.) Part of the reason RF cooking is on the horizon now is because it can be paired with smart technology. 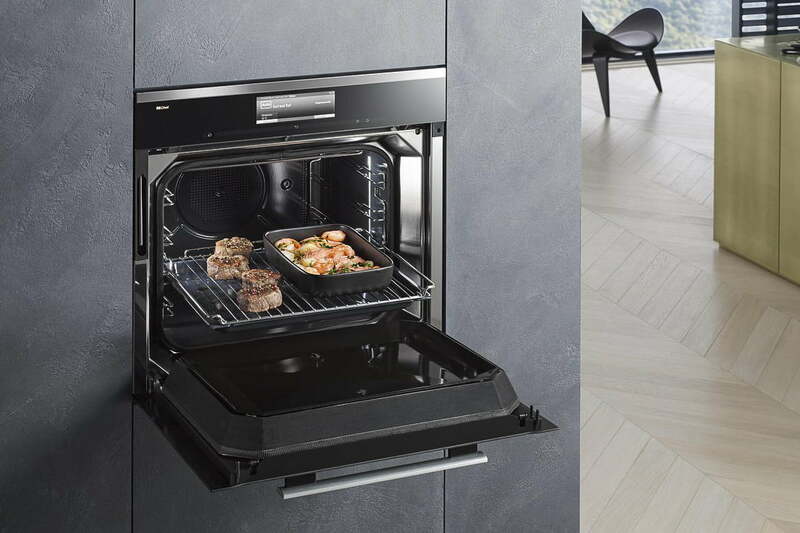 The Dialog oven is Wi-Fi enabled, so even though it’s launching with only a 100 or so recipes, Miele can always push out more via updates as their chefs perfect new meals and techniques. Manufacturers creating appliances now can use the circuitry to create presets that are similar to the popcorn buttons on some microwaves. Considering the trial and error that will go into learning how to use RF cooking, the benefits had better outweigh the hassle. It’s faster than cooking in a conventional (even convection) oven. The veal, zucchini, and tomato dish took 35 minutes with no preheating. RF defrosts more effectively. In a demonstration, Miele chefs put a frozen, iced cake in a microwave and the Dialog oven. The microwaved cake was thawed but the topping was melted. The Dialog’s cake looked the same as when it went in, and the chef sliced into it with ease. Because RF isn’t applying heat, it allows for some interesting outcomes. The Miele chefs made a variety of brightly colored buns from red, green, and yellow dough. In a regular oven, the color was covered by a brown crust. You’ll never get that crust from RF cooking, so while cooked, the buns were still vibrantly colorful. Furthermore, none of the mini soufflés Miele served for dessert fell. Viza agrees we’ll see more RF cookers in the next year or two, especially now that Miele has debuted its oven. Though they’ll be pricey at debut, they likely won’t be at the $10,000 mark. Miele is a premium brand, and the Dialog doubles as a traditional oven, so it can add some last-minute heat to brown or crisp. Werner said the RF Energy Alliance would like to standardize equipment like the RF generator to help bring down the price as well.